The investment grade segment of the tax-exempt US municipal bond market differentiates itself from other US fixed-rate bond markets by typically trading to a spread to a AAA municipal bond yield curve that is created by amalgamating market color from the primary and secondary markets' trading activity in lieu of benchmarking against a government bond yield. There is still significant correlation between the AAA municipal bond yield curve and the US Treasury (NYSEARCA:UST) yield curve, but municipal bonds yields are often (albeit not always) lower than their equivalent maturity government bonds, given their tax benefit. 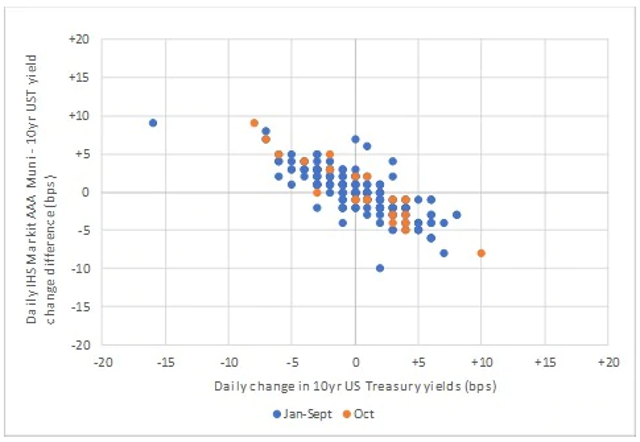 Data indicates that daily changes in municipal bond yields matched up exactly with changes to their equivalent maturity Treasury bond yield on 12% of the trading in 2018 (through October). Figure 1 shows the frequency of the daily spread difference between the 10yr AAA municipal bond yields curve from IHS Markit versus the 10-yr UST, with the color of the bar indicating the direction of 10-yr UST yields on a given day. For example, on Oct 17, 10-yr AAA municipal bond yield curve from IHS Markit decreased by 1bp and 10-yr UST yields increased by 3bps, which resulted in a -4bp (-1bp-3bps) differential in favor of municipal bonds. 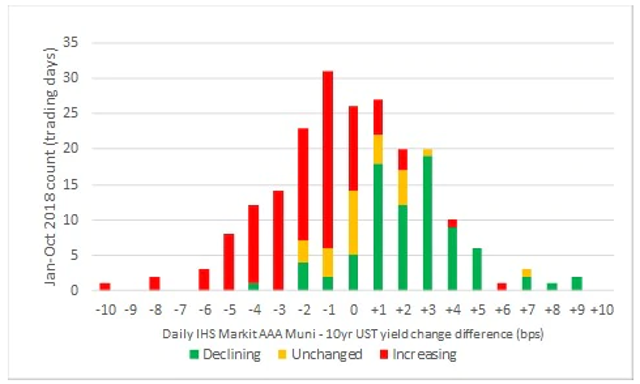 The chart indicates that 10-yr AAA municipal bond yields typically rose less than 10-yr UST yields on days when Treasuries sold off, but municipal bond yields did decline less than UST on days when rates rallied. These dynamics are partially explained by the fact that IG municipal bonds typically trade based on their yield ratio to an equivalent maturity UST (ratio is usually less than 100%), so maintaining the same ratio in a rising rate environment would require municipal bond yields to decline less and vice versa for a declining rate environment. 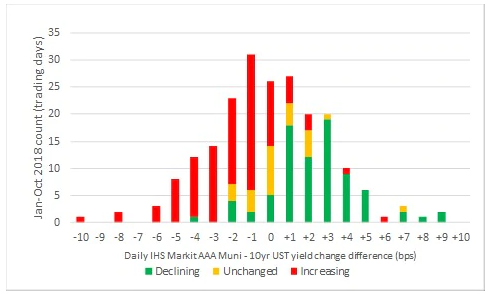 Over the course of 2018 through October, data indicated that there were only seven out of the 210 trading days where 10-yr AAA municipal bond yields declined more on days when UST yields also declined (Figure 2). The data also shows that there were only 10 days when 10-yr AAA municipal bond yields increased more on days when UST yields also increased. October was a particularly unique month, as there were two days near the extremes of daily Treasury rates movements during the year, with 10-yr UST yields decreasing 10bps versus AAA municipal bond yields only increasing 2bps on October 3 and 10-yr UST yields declining 8bps versus AAA municipal bond yields increasing 1bp on October 11. In reality, there are few (if any) ways to actually take advantage of the daily differences in AAA municipal bond yield and price movements in a rising rate environment versus UST (or bonds benchmarked to it), given the low supply of AAA municipal bonds and the limited liquidity of the sector versus UST and corporate bonds. It is worth noting that municipal bonds rated below AAA still have a credit spread component that has its own dynamics in different rate environments which needs to be considered. In addition, the low yields of tax exempt municipal bonds make investing in the bonds impractical if the holder can't receive the tax savings like in the case of a non-US investor.